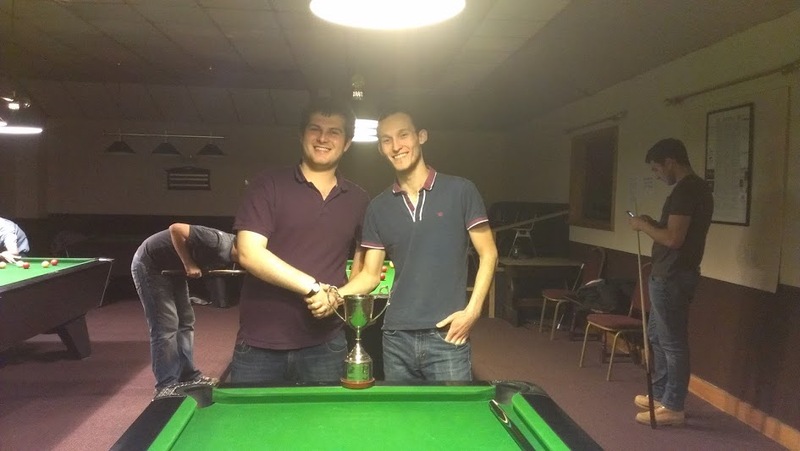 The 2013 CU Masters was held on March 10th at Cambridge Snooker Centre. 8 players were seeded and were drawn randomly against the other 8 competitors. A strong field arrived, full of anticipation, at 1-30pm ready for the off. The games began quickly with all but one seed securing victory in the first round- Rik O'Connor losing a tense decider to CUPC stalwart, and Competition Secretary, Jon Nelson. Jon then started strongly in his quarter-final, going 3-1 up against top seed Hugh Lund before the cheap lager kicked in and the incredible Mr Lund won 4 in a row to secure his place in the semis. Paul and James made short work of their opponents whilst, in their first competitive encounter, Drew Miley and Tarun Manjunath did battle to see who could reign supreme in the Homerton pool team. Even an indoor scarf could not slow Drew's victory, as he triumphed 5-2 in a game of much potting and little safety. With only the semi-finals left, tables began to free up and the competition secretary (table slave) assisted the CSC greatly by taking the balls back to the bar. Great work! Jetsetter James Palmer, fresh from his trip to Oxford, triumphed over Hugh Lund in a battle of the lager drinkers whilst, on the other table, Paul Thomas was pitted against Drew Miley in what was to be his last CUPC tournament. After 4 runner-up placings � la Lendl, could he finally win a tournament? Sadly not, as he was defeated 6-4 with the pressure telling on his face. That left only James Palmer and Drew Miley left standing for the final. After surging into a 3-0 lead, a costly missed chance turned the tide of the match and Palmer went on to win 7 of the next 8 frames to wrap up his first Cambridge pool title at the last time of asking. The tournament concluded with a valiant effort from Jon Nelson, collecting the empties and taking them to the bar as the competitors finally left. There surely are many strings to his bow! The finalists eyeing up the silverware. There was no repeat of the controversy surrounding CUPC's previous tournament as Rob Hogan, who arrived just in time to present the trophy, had to go home at 11pm as it was past his bedtime! A plate competition was contested by those who lost in the last 16 of the main event. Niall Murphy disposed of a strong field and walked away with the prize money, defeating James Ross 5-3 in a hard-fought final.